Hello, would you like to buy something weird? Hammer Time is our guide to things that are for sale in New York City: fantastic, consequential and freakishly grotesque archival treasures that appear in public for just a brief moment, most likely never to be seen again. For his final act, Jung cast an analytical eye on UFOs. In the threatening situation of the world today, when people are beginning to see that everything is at stake, the projection-creating fantasy soars beyond the realm of earthly organizations and powers into the heavens, into interstellar space, where the rulers of human fate, the gods, once had their abode in the planets…. Even people who would never have thought that a religious problem could be a serious matter that concerned them personally are beginning to ask themselves fundamental questions. Under these circumstances it would not be at all surprising if those sections of the community who ask themselves nothing were visited by visions,’ by a widespread myth seriously believed in by some and rejected as absurd by others. 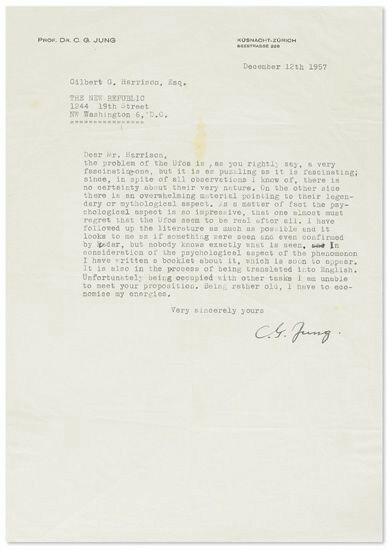 Swann is auctioning the letter this week, which it estimates to be worth $2,000–3,000.00, as part of its three-day “Autographs” auction in New York City. 2 A Dangerous Method was marketed as a “historical film,” but it was based on a screenplay adapted from the 1993 novel by John Kerr, A Most Dangerous Method: The Story of Jung, Freud, and Sabrina Spielrein. Nevertheless, Spielrein was indeed treated by Jung at the Burghölzli mental hospital near Zürich; he later became her medical dissertation advisor. It is believed they engaged in an affair that violated professional ethics. Whether they did so in such a clinical fashion, as depicted in the movie, is debatable, and certainly disappointed critics. 3 Princeton University Press reprinted a translated edition of Flying Saucers in 1979. Alexis Coe is now a writer living in San Francisco, but not long ago, she was a research curator at the New York Public Library. Her work has appeared in the Atlantic, Slate, The Millions, and other publications. Alexis holds an MA in history. Follow her. Image courtesy of Swann Auction Galleries, 104 East 25th Street.